Named for Otto von Bismarck, the nineteenth-century Prussian statesman who forged the German nation, Bismarck was, with her sister ship Tirpitz, one of the two largest German warships ever built. 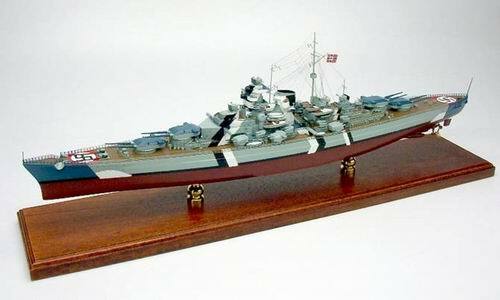 Commissioned nearly a year after the outbreak of World War II, Bismarck's first combat mission was also her last. On May 18, 1941, under command of Captain Ernst Lindemann and flying the flag of Vice Admiral G¨¹nther L¨¹tjens, she sailed from the Baltic seaport of Gdynia with the pocket battleship Prinz Eugen on a commerce-raiding mission code-named Operation Rhein¨¹bung. Putting into Bergen, the ships were spotted by RAF planes and the British fleet mobilized to prevent their breakout into the Atlantic. Under cover of night and bad weather, the ships slipped into the Norwegian Sea and sailed north and west around Iceland. On May 23, Bismarck and Prinz Eugen were sighted in the Denmark Strait northwest of Iceland by the British cruisers HMS Suffolk and Norfolk. On May 22, the Battle Cruiser Force of HMS Hood and Prince of Wales had sailed from Scapa Flow and was now southwest of Iceland about 300 miles away. Vice Admiral L. E. Holland steered an interception course and contact between the two forces was established at 0537 on May 24. Prince of Wales opened fire at 0553 at a range of about 12 miles. Bismarck engaged Hood, and at 0600 a 15-inch shell from her fourth salvo tore through the ship, which split in two and sank with the loss of 1,415 men. Prince of Wales was hit repeatedly before breaking off action 13 minutes later, though not before landing three crucial hits on Bismarck. With his ship down in the bow and leaking oil, L¨¹tjens decided to make for the French port of St. Nazaire. At 0847 on May 27, Rodney opened fire at a range of 25,000 yards, King George V a minute later, and the cruisers HMS Norfolk and Dorsetshire somewhat later. The range quickly closed to only 8,600 yards and by 0930 Bismarck's main armament had been silenced. Dorsetshire was ordered to sink Bismarck with torpedoes, though survivors maintained that scuttling charges and not torpedoes sank the ship. Dorsetshire and the destroyer Maori rescued 115 survivors, but a suspected submarine sighting forced them to break off their search. A total of 1,977 of Bismarck's crew went down with their ship.